We’re taking the new year as a chance to look back at 2018 – and specifically how news websites performed in Google News and the search engine results pages in the UK. All data is based on the Trisolute News Dashboard – a one-of-a-kind SEO tool that gives near-real-time data about rankings in Google News and the SERPs. To level the playing field and cover most general-interest news topics of 2018, we chose to base the analyses on our general keyword set. This set is based on Google News and Trends topics. We will cover the top 10 for the general News Boxes on desktop and mobile and top publishers for the different categories and will then move on to Google News. We will also add pictures for the most interesting results and add a special surprise at the end. We see that bbc.co.uk and theguardian.com are far and away the most visible publishers of 2018. The top keywords are spread out between country-wide news, technology and sports. Interestingly, few publishers share the month they registered their top visibility. Here we see cnn.com, which is the most visible publisher across all ranking types in the U.S., broaden its visibility into Google’s UK news-related rankings, but with a U.S. topic in their best month. The Guardian and BBC duke it out throughout the entire year in the Business category. Interestingly, only a few of the top publishers in the Sports category are actually sports verticals, with the No. 1 publisher also being general interest. The U.S.-based cnn.com is giving UK publishers a run for their money in the World category. 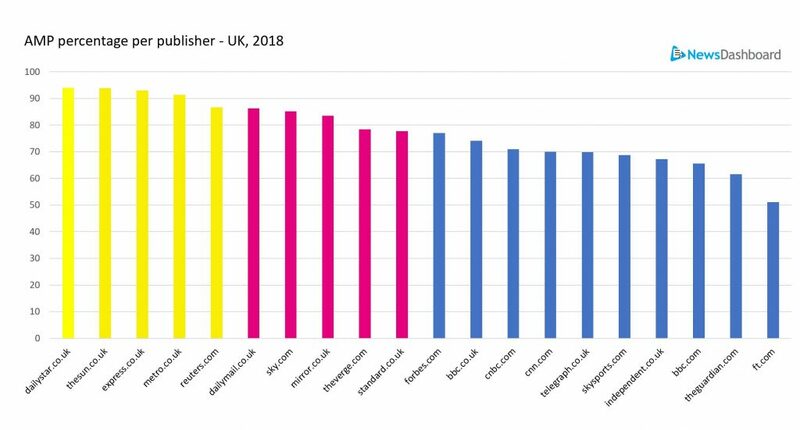 Unlike any other publisher in the Top 10 for this ranking type, dailymail.co.uk dropped in visibility over 2018. Brexit is obviously top of mind for many folks living in the UK, whichever way it turns out – and that is reflected in the top keywords here. In fact, “brexit” is the top keyword for theguardian.com in the mobile and desktop News Boxes. Again, a fairly high number of entertainment and technology keywords for the Top 10 publishers. And that pesky U.S. publisher cnn.com makes yet another appearance. We see the same drop here from dailymail.co.uk in visibility, but they do recover in the Entertainment category starting in November. The No. 1 publisher by visibility in the Science category, space.com, is also in the Top 3 for other countries. We see a number of U.S.-based technology publishers in this category, mixed with some of the UK publishers who had technology keywords as their most visible in the overall ranking type. 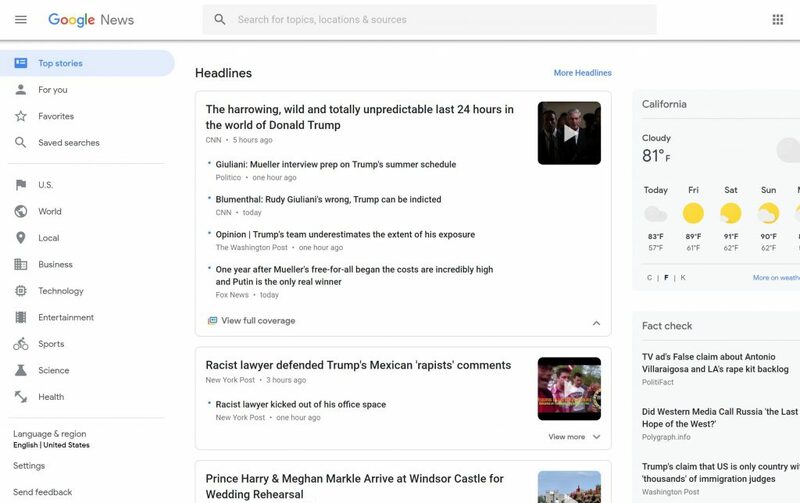 In May 2018, Google undertook a complete redesign of news.google.com, both in the front-end look and the back-end and algorithm. When you look at the visibility over 2018, you can clearly see that changes that happened started in May. Unlike most other countries we considered in our year in review analyses, youtube.com did not become a part of the Google News Top 10 most visible publishers. This might indicate that Google is surfacing fewer videos in Google News UK. As the opposite to the declines we saw at the beginning of 2018 in other ranking types, metro.co.uk saw a precipitous drop at the end of the year. In the Business category, bbc.co.uk had an absolute windfall in visibility, overtaking the the previous No. 1 and No. 2 after the Google News redesign. Similar to what we’ve seen in other countries after the Google News redesign, when a publisher such as theguardian.com is far and away the No. 1 most visible, they were pushed down closer to the other news websites. We theorize this might be due to Google introducing a greater variety of publishers into news.google.com. The Top 2 publishers in the United Kingdom category do almost a dance of visibility, swapping visibility twice throughout 2018. As mobile devices continue to draw a larger audience, publishers need to pay attention to Accelerated Mobile Pages, or AMP. Google has all but said it is AMP enabled for mobile ranking types, which are more user-friendly, but of course there are challenges as far as page layout and especially monetization. The graphic below shows the percentage of AMP rankings in the general Mobile News Boxes for 2018 of the top 20 most visible publishers. The Top 20 publishers all have rankings over 50 percent, which shows a high rate of AMP uptake in UK news websites. Unlike other countries, the Google News redesign did not result in youtube.com entering the Google News top rankings, though certainly there were other big changes. Overall, two UK publishers – theguardian.com and bbc.co.uk – ruled most rankings and categories. There was an unusual number of technology and entertainment keywords as most visible for the publishers in the Top 10 lists for overall ranking types. Lastly, the top publishers in mobile News Boxes have unusually high AMP rankings compared with the other countries (France, US, Australia, Germany, Switzerland) we’ve measured in these year in review analyses. We collect our news-related keywords from Google News (news.google.com) as well as Google Trends, and keywords are from Jan. 1-Dec. 31, 2018, for this analysis. News: Business, Entertainment, Health, UK, Science, Sports, Technology, Top Stories and World. 15 minutes rankings checks and on Google News every 30 minutes. 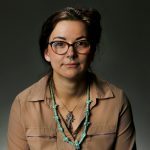 What U.S. publisher dominated Google’s news rankings in 2018? 2018 im Rückblick – Welcher schweizer Publisher war am sichtbarsten? Your trial access is free, non-binding and ends automatically. I have read the data protection page and accept it.